Winter is the perfect time for some of our favorite sports, including skiing and snowboarding. Unfortunately, those cold chills don't always allow athletes and outdoor enthusiasts to perform at their optimal level. Cold temperatures can cause the body to be slow, tight, and even painful, leading to a miserable outside experience. The feet and toes are especially susceptible to frigid temperatures. That's why it's essential not just to keep yourself warm, but also to have a constant, reliable heat source. 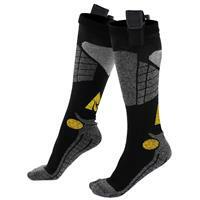 Heated socks for men are the perfect solution. They're a game-changer for those who want to move and perform their best on the slopes. Although designed specifically for those who need warmer feet when skiing and snowboarding, you can use them for any cold weather outdoor pursuit — including hiking, shoveling, or building a snowman with your kids. 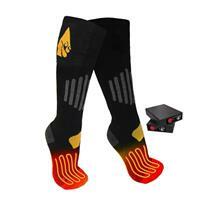 If you're in the market for heated socks, you'll love the selection available at Buckman's Ski and Snowboard Shops. We invite you to check out our options online at Buckmans.com or come by one of our seven retail locations in Pennsylvania. What Are Men's Heated Socks? 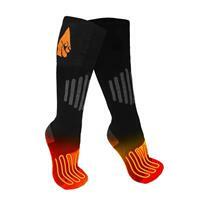 Heated socks are socks that use innovative heating technology to keep your feet warm. Discreet pouches on the side of the socks hide tiny battery packs. The majority of heated socks include rechargeable batteries, so you can have them ready to go each time you plan a cold weather excursion. The most important aspect of heated socks is what they can do for you. 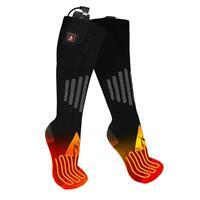 An adjustable temperature control allows you to customize your sock heat level to whatever feels best on your feet. Keep them low if your toes are just a bit chilly, or crank them to medium or high if you're that person whose feet turn to ice every time you step outside into the cold. Besides keeping your toes from getting frozen, there are a number of different benefits that heated socks provide. These advantages are especially compelling for athletes and other men who spend a lot of time engaging in winter sports, as heat therapy provides relief for sore or injured muscles and helps speed the recovery process. At Buckman's Ski and Snowboard Shops, our goal is to get you outfitted for your next skiing or snowboarding adventure or any other winter pursuit. We provide exceptional customer service provided by those who love the outdoors as much as you do. But we pair that with a huge selection of outstanding products from the nation's top brands for men, women and youth. Incredible Prices: We're so confident our prices are the best out there that we offer a price-matching guarantee just in case. Find it cheaper somewhere else and we'll match it. Save on Shipping: If you purchase $50 or more of gear, accessories, or apparel, most orders receive free shipping. Going Green: As lovers of the great outdoors, we want to do our part in protecting the environment. A few ways we do that is by investing in solar energy solutions and initiating an extensive recycling program. Got questions? As avid winter sports enthusiasts ourselves, our staff is ready and waiting to answer any and all queries. Hope to see you on the slopes soon!